SMALL University of Kansas Travel Bag KU Jayhawks Gym Workout Bag by Broad Bay at freespiritedfit.com. MPN: KU-102ROY. Hurry! Limited time offer. Offer valid only while supplies last. This fantastic small KU Jayhawks gym bag is great as an official University of Kansas duffel bag, or as a compact University of Kansas travel bag. This fantastic small KU Jayhawks gym bag is great as an official University of Kansas duffel bag, or as a compact University of Kansas travel bag. This deluxe OFFICIAL University of Kansas small duffel bag is loaded with useful features such as zippered pockets on each end, a front pocket, and an easy access d-shaped double zippered main compartment opening. 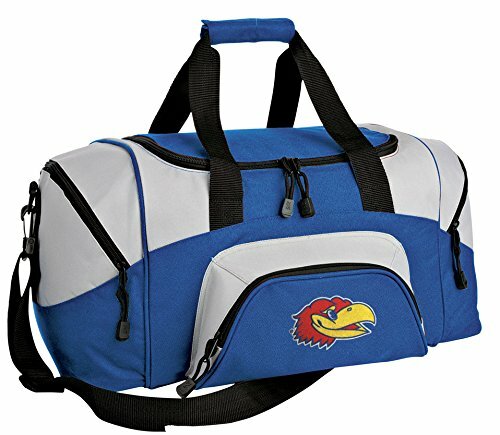 This Broad Bay small University of Kansas duffel or KU Jayhawks gym bag includes an adjustable detachable shoulder strap, padded carry handles, and tough 600 Denier fabric construction. (Size: 10.5" x 21" x 10") This unique KU Jayhawks duffle bag makes a unique University of Kansas Gift! Official University of Kansas Logo Duffel Bags- Up to 12% Returned to Support University of Kansas Programs! Official KU Jayhawks Merchandise - Up to 12% Returned to Support KU Jayhawks Programs! This High Quality, Small Sized University of Kansas Duffel Bag Features a Padded Adjustable and Removable Shoulder Strap & Loads of Pockets to Organize Your Stuff! COMPACT SIZE KU Jayhawks Duffel Bag (Size: 10.5" x 21" x 10") -Perfect for Shoes and a Change of Clothes! A Great Small KU Jayhawks Gym Bag or Workout Bag! This Fantastic University of Kansas Duffel Is A Great KU Jayhawks Gift for a Man or A Woman! This Official College Logo University of Kansas Bag is Produced by Broad Bay Cotton Company-in Business Since 1989 - Your Satisfaction is Guaranteed!